It is said that misery loves company, and this certainly seems to be the case for Islamophobes. Imagine an Islamophobe sitting alone, bitter, and miserable, unable to find a more meaningful calling in life than harassing people he doesn’t know and hating a religion that he doesn’t understand and is too arrogant to learn about it. He may be in a dark room, staring at a bright laptop screen, scrolling through the Facebook or Twitter feed of some stalwart of the Islamophobia industry for a running list of examples of how evil, backward, deceptive, and conspiratorial the Muslims are. He feels compelled to fight this menace, but for this heroic mission he will need some support. So he starts a Facebook page, and invites like-minded low-lives to join the movement. This is a hypothetical example. 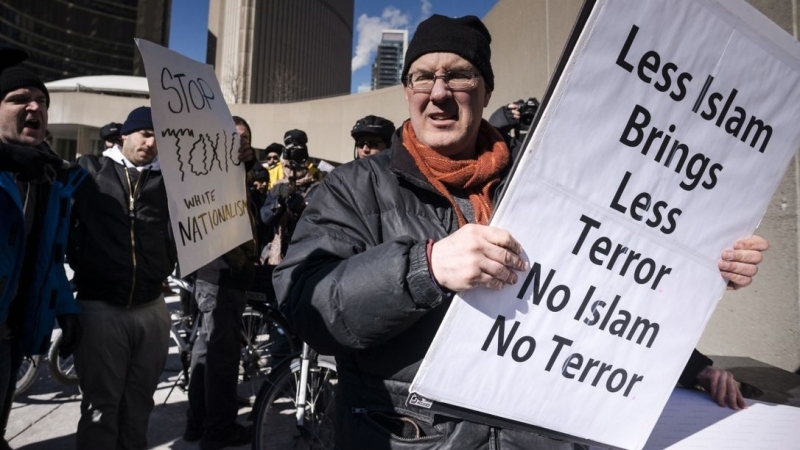 However, it is not too far off the mark in describing the origins of some of the most prominent Islamophobic groups and movements in Canada, including Jewish Defense League (JDL) Canada, Never Again Canada, Rise Canada, Canadian Coalition of Concerned Citizens, PEGIDA Canada, and Soldiers of Odin Canada. As the names suggest, many of these are international in scope, but it is useful to summarize the activity of their Canadian chapters, so that conscientious Canadians can keep tabs of their socially-destructive work and recognize trends that can potentially help us prevent similar hate-peddling groups from springing up. Let’s start by looking at the two groups that have come from across the pond in Europe. Soldiers of Odin (SOO) was founded in 2015 in Finland, in the wake of thousands of refugees arriving in the country, ostensibly as a “community-watch organization” that conducts street patrols. The group is known for its strong anti-immigrant views, even though its stated purpose is to “fight crime.” The founder, Mika Ranta, has connections to the neo-Nazi Nordic Resistance Movement, and a criminal conviction related to racially-motivated assault in 2005. SOO Canada’s national president, Joel Angott, insists that the group does not condone violence, and so far this does seem to be true. 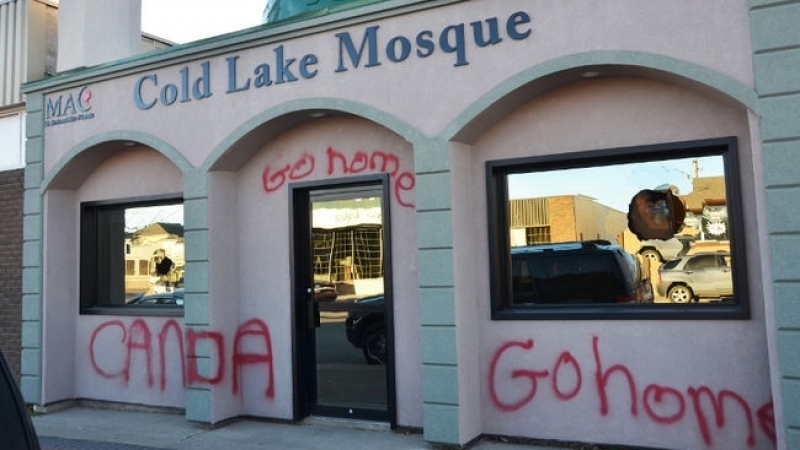 However, the group is active in spreading Islamophobic sentiments, both on its Facebook page and in many protests and events, including their “street patrols” in cities like Edmonton. PEGIDA is the acronym for the original German name of “Patriotic Europeans Against the Islamisation of the Occident.” This group was formed (on Facebook, of course) in Germany in 2014. A photo soon surfaced of its founder, Lutz Bachmann, a convicted burglar-turned-graphic designer, posing as Adolf Hitler. However, many seemed to have been inspired by such imagery and PEGIDA’s divisive and inflammatory rhetoric, including some Canadians. By March 2015, PEGIDA Canada was operating nationally, with local chapters in British Columbia and Quebec. Like many of these groups, in Canada they are mainly keyboard warriors, though that does not necessarily make them any less dangerous. PEGIDA Canada’s Facebook page has over 25,000 “likes” and receives a lot of traffic. It is used as a platform for organizing Islamophobic events, including a large protest at Queen’s Park in September 2015. Mika Ranta, founder of the Soldiers of Odin vigilante group in, of all places, Finland, received an 18-month suspended sentence after he was convicted of attacking a man and a woman. Ranta has con-nections with the neo-Nazi Nordic Resistance Movement, as well as a 2005 conviction for racially aggravated assault. Now, the move-ment has established chapters across Europe and North America. Then there is Jewish Defence League (JDL), arguably the most well-known far-right Zionist group operating in Canada. JDL was started in New York City in 1968 by an extremist rabbi, Meir Kahane, who felt that a more militant Zionism was necessary for the survival of the Jews. In 2001, the FBI flagged the JDL as a terrorist and extremist group after two plots to carry out acts of terrorism in the United States were revealed. The JDL arrived in Canada as early as 1970, led by Meir Weinstein, who is recognized as the leader of JDL across North America since 2017. The JDL has a record of ties to violence. In March 2016, a Canadian JDL member physically beat a Palestinian-American man outside an AIPAC conference in Washington, DC, kicking him on the ground and beating him with a flagpole until the police arrived. In 2011, the RCMP reportedly investigated the group over an alleged plot to bomb Palestine House, a Palestinian community centre in Mississauga, Ontario. Apparently such measures and the JDL’s regular involvement in Islamophobic events are necessary for the “defence” of the Jewish people. 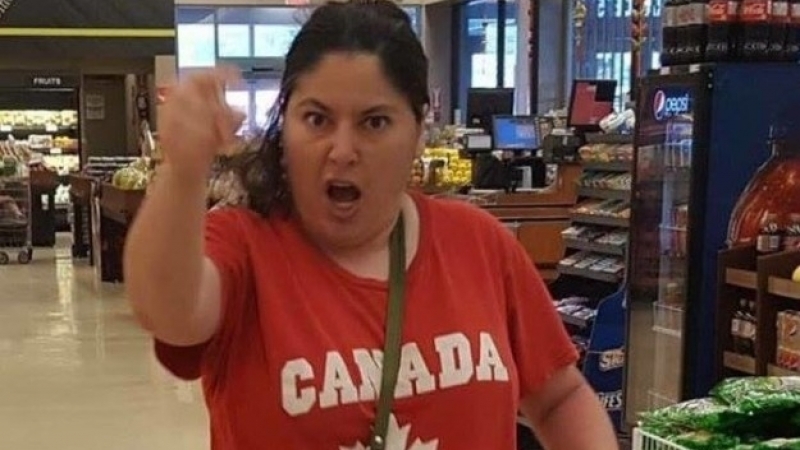 One of the more peaceful-sounding names in our list is the Canadian Coalition of Concerned Citizens (CCCC), but it is just another online hate factory. The CCCC was founded by one Georges Hallak and is based in Montreal. Its Facebook page posts videos of Hallak speaking on different topics, including the supposed dangers of M-103, MP Iqra Khalid’s anti-Islamophobia motion. The page is also used as a platform for organizing anti-Muslim rallies, as well as spreading misinformation. Next up, we have Never Again Canada (NAC). Never Again Canada is an ultra-Zionist organization — really, just another Facebook page — that was founded in 2014 by Abraham Shomer, a web developer who lives just outside of Toronto. Shomer said he wanted to provide a “platform for ideas,” and the stated purpose of NAC is “fighting anti-Semitism, propaganda, terror and Jew-hatred in Canada.” NAC has more than 171,000 “likes” on its page, and posts on the page collectively are seen by at least three million people, most of them Canadians, on a weekly basis. Thus, it has become one of the more far-reaching Islamophobic platforms based in Canada. This is a brief look at some of the organizations that lead or enable the spread of Islamophobia in Canada. It is important to keep track of these groups, because they often operate in seemingly benign ways, such as Islamophobic conversations on Facebook, but such rhetoric often has serious real-life consequences.